We present an approach to U⋆(N) Yang-Mills theory in non-commutative space based upon a novel phase-space analysis of the dynamical fields with additional auxiliary variables that generate Lorentz structure and colour degrees of freedom. To illustrate this formalism we compute the quadratic terms in the effective action focusing on the planar divergences so as to extract the β-function for the Yang-Mills coupling constant. Nonetheless the method presented is general and can be applied to calculate the effective action at arbitrary order of expansion in the coupling constant and is well suited to the computation of low energy one-loop scattering amplitudes. M.M. Faruk, M. Al Alvi, W. Ahmed, M.M. Rahman and A.B. Apu, Noncommutative scalar fields in compact spaces: quantization and implications, PTEP 2017 (2017) 093B02 [arXiv:1707.01643] [INSPIRE]. A.Y. Alekseev, A. Recknagel and V. Schomerus, Noncommutative world volume geometries: Branes on SU(2) and fuzzy spheres, JHEP 09 (1999) 023 [hep-th/9908040] [INSPIRE]. R. Bonezzi, O. Corradini, S.A. Franchino Vinas and P.A.G. Pisani, Worldline approach to noncommutative field theory, J. Phys. A 45 (2012) 405401 [arXiv:1204.1013] [INSPIRE]. Y. Kiem, S.-J. Rey, H.-T. Sato and J.-T. Yee, Anatomy of one loop effective action in noncommutative scalar field theories, Eur. Phys. J. C 22 (2002) 757 [hep-th/0107106] [INSPIRE]. N. Ahmadiniaz, O. Corradini, D. D’Ascanio, S. Estrada-Jiménez and P. Pisani, Noncommutative U(1) gauge theory from a worldline perspective, JHEP 11 (2015) 069 [arXiv:1507.07033] [INSPIRE]. Y.-j. Kiem, Y.-j. Kim, C. Ryou and H.-T. Sato, One loop noncommutative U(1) gauge theory from bosonic worldline approach, Nucl. Phys. B 630 (2002) 55 [hep-th/0112176] [INSPIRE]. M.J. Strassler, Field theory without Feynman diagrams: One loop effective actions, Nucl. Phys. B 385 (1992) 145 [hep-ph/9205205] [INSPIRE]. M.B. Halpern and W. Siegel, The Particle Limit of Field Theory: A New Strong Coupling Expansion, Phys. Rev. D 16 (1977) 2486 [INSPIRE]. M.B. Halpern, A. Jevicki and P. Senjanovic, Field Theories in Terms of Particle-String Variables: Spin, Internal Symmetries and Arbitrary Dimension, Phys. Rev. D 16 (1977) 2476 [INSPIRE]. H.-T. Sato and M.G. Schmidt, Worldline approach to the Bern-Kosower formalism in two loop Yang-Mills theory, Nucl. Phys. B 560 (1999) 551 [hep-th/9812229] [INSPIRE]. P. Dai, Y.-t. Huang and W. Siegel, Worldgraph Approach to Yang-Mills Amplitudes from N = 2 Spinning Particle, JHEP 10 (2008) 027 [arXiv:0807.0391] [INSPIRE]. M. Reuter, M.G. Schmidt and C. Schubert, Constant external fields in gauge theory and the spin 0, 1/2, 1 path integrals, Annals Phys. 259 (1997) 313 [hep-th/9610191] [INSPIRE]. N. Ahmadiniaz, F. Bastianelli and O. Corradini, Dressed scalar propagator in a non-Abelian background from the worldline formalism, Phys. Rev. D 93 (2016) 025035 [arXiv:1508.05144] [INSPIRE]. P. Mansfield, The fermion content of the Standard Model from a simple world-line theory, Phys. Lett. B 743 (2015) 353 [arXiv:1410.7298] [INSPIRE]. J.P. Edwards, Unified theory in the worldline approach, Phys. Lett. B 750 (2015) 312 [arXiv:1411.6540] [INSPIRE]. J.P. Edwards and O. Corradini, Worldline colour fields and non-Abelian quantum field theory, EPJ Web Conf. 182 (2018) 02038 [arXiv:1711.09314] [INSPIRE]. T. Krajewski and R. Wulkenhaar, Perturbative quantum gauge fields on the noncommutative torus, Int. J. Mod. Phys. A 15 (2000) 1011 [hep-th/9903187] [INSPIRE]. C.P. Martin and D. Sánchez-Ruiz, The one loop UV divergent structure of U(1) Yang-Mills theory on noncommutative R 4, Phys. Rev. Lett. 83 (1999) 476 [hep-th/9903077] [INSPIRE]. L. Álvarez-Gaumé and S.R. Wadia, Gauge theory on a quantum phase space, Phys. Lett. B 501 (2001) 319 [hep-th/0006219] [INSPIRE]. A. Iskauskas, A Remark on Polar Noncommutativity, Phys. Lett. B 746 (2015) 25 [arXiv:1503.03684] [INSPIRE]. J.P. Edwards, Non-commutativity in polar coordinates, Eur. Phys. J. C 77 (2017) 320 [arXiv:1607.04491] [INSPIRE]. E. Chang-Young, D. Lee and Y. Lee, Noncommutative BTZ Black Hole in Polar Coordinates, Class. Quant. Grav. 26 (2009) 185001 [arXiv:0808.2330] [INSPIRE]. A.F. Ferrari et al., Towards a consistent noncommutative supersymmetric Yang-Mills theory: Superfield covariant analysis, Phys. Rev. D 70 (2004) 085012 [hep-th/0407040] [INSPIRE]. B.S. DeWitt, Quantum Theory of Gravity. 2. The Manifestly Covariant Theory, Phys. Rev. 162 (1967) 1195 [INSPIRE]. L.F. Abbott, Introduction to the Background Field Method, Acta Phys. Polon. B 13 (1982) 33 [INSPIRE]. L.F. Abbott, M.T. Grisaru and R.K. Schaefer, The Background Field Method and the S Matrix, Nucl. Phys. B 229 (1983) 372 [INSPIRE]. N. Ahmadiniaz and C. Schubert, A covariant representation of the Ball-Chiu vertex, Nucl. Phys. B 869 (2013) 417 [arXiv:1210.2331] [INSPIRE]. N. Ahmadiniaz and C. Schubert, Gluon form factor decompositions from the worldline formalism, PoS(LL2016)052 (2016) [INSPIRE]. N. Ahmadiniaz and C. Schubert, QCD gluon vertices from the string-inspired formalism, Int. J. Mod. Phys. E 25 (2016) 1642004 [arXiv:1811.10780] [INSPIRE]. O. Corradini and M. Muratori, String-inspired Methods and the Worldline Formalism in Curved Space, Eur. Phys. J. Plus 133 (2018) 457 [arXiv:1808.05401] [INSPIRE]. F. Bastianelli and P. van Nieuwenhuizen, Path integrals and anomalies in curved space, Cambridge Monographs on Mathematical Physics, Cambridge University Press (2006) [INSPIRE]. F. Bastianelli, R. Bonezzi, O. Corradini, E. Latini and K.H. Ould-Lahoucine, A worldline approach to colored particles, 2015, arXiv:1504.03617 [INSPIRE]. F. Bastianelli, P. Benincasa and S. Giombi, Worldline approach to vector and antisymmetric tensor fields. II., JHEP 10 (2005) 114 [hep-th/0510010] [INSPIRE]. A. Barducci, R. Casalbuoni and L. Lusanna, Anticommuting Variables, Internal Degrees of Freedom and the Wilson Loop, Nucl. Phys. B 180 (1981) 141 [INSPIRE]. R. Bonezzi, Induced Action for Conformal Higher Spins from Worldline Path Integrals, Universe 3 (2017) 64 [arXiv:1709.00850] [INSPIRE]. F. Bastianelli and R. Bonezzi, U(N) spinning particles and higher spin equations on complex manifolds, JHEP 03 (2009) 063 [arXiv:0901.2311] [INSPIRE]. F. Bastianelli and R. Bonezzi, U(N |M) Quantum Mechanics on Kähler Manifolds, JHEP 05 (2010) 020 [arXiv:1003.1046] [INSPIRE]. F. Bastianelli and R. Bonezzi, Quantum theory of massless (p, 0)-forms, JHEP 09 (2011) 018 [arXiv:1107.3661] [INSPIRE]. F. Bastianelli, R. Bonezzi and C. Iazeolla, Quantum theories of (p, q)-forms, JHEP 08 (2012) 045 [arXiv:1204.5954] [INSPIRE]. M. Reuter, Metaplectic spinor fields and global anomalies, Int. J. Mod. Phys. A 10 (1995) 65 [INSPIRE]. F. Bastianelli, O. Corradini and A. Zirotti, dimensional regularization for N = 1 supersymmetric σ-models and the worldline formalism, Phys. Rev. D 67 (2003) 104009 [hep-th/0211134] [INSPIRE]. 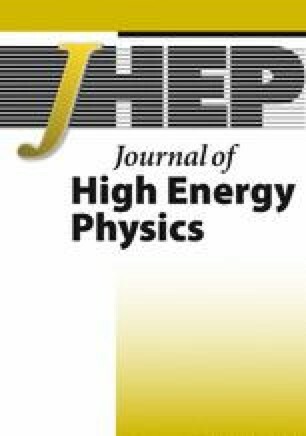 W. Bietenholz, J. Nishimura, Y. Susaki and J. Volkholz, A Non-perturbative study of 4-D U(1) non-commutative gauge theory: The Fate of one-loop instability, JHEP 10 (2006) 042 [hep-th/0608072] [INSPIRE]. A. Armoni, Comments on perturbative dynamics of noncommutative Yang-Mills theory, Nucl. Phys. B 593 (2001) 229 [hep-th/0005208] [INSPIRE]. R. Fresneda, D.M. Gitman and A.E. Shabad, Photon propagation in noncommutative QED with constant external field, Phys. Rev. D 91 (2015) 085005 [arXiv:1501.04987] [INSPIRE]. D. D’Ascanio, P. Pisani and D.V. Vassilevich, Renormalization on noncommutative torus, Eur. Phys. J. C 76 (2016) 180 [arXiv:1602.01479] [INSPIRE]. H. Grosse and R. Wulkenhaar, Renormalization of phi**4 theory on noncommutative R 2 in the matrix base, JHEP 12 (2003) 019 [hep-th/0307017] [INSPIRE]. E. Langmann, R.J. Szabo and K. Zarembo, Exact solution of noncommutative field theory in background magnetic fields, Phys. Lett. B 569 (2003) 95 [hep-th/0303082] [INSPIRE]. A. de Goursac, J.-C. Wallet and R. Wulkenhaar, Noncommutative Induced Gauge Theory, Eur. Phys. J. C 51 (2007) 977 [hep-th/0703075] [INSPIRE]. H. Grosse and M. Wohlgenannt, Induced gauge theory on a noncommutative space, Eur. Phys. J. C 52 (2007) 435 [hep-th/0703169] [INSPIRE]. J. Madore, S. Schraml, P. Schupp and J. Wess, Gauge theory on noncommutative spaces, Eur. Phys. J. C 16 (2000) 161 [hep-th/0001203] [INSPIRE]. D.N. Blaschke, H. Grosse, E. Kronberger, M. Schweda and M. Wohlgenannt, Loop Calculations for the Non-Commutative U∗(1) Gauge Field Model with Oscillator Term, Eur. Phys. J. C 67 (2010) 575 [arXiv:0912.3642] [INSPIRE]. F. Bastianelli and A. Zirotti, Worldline formalism in a gravitational background, Nucl. Phys. B 642 (2002) 372 [hep-th/0205182] [INSPIRE]. F. Bastianelli, The Path integral for a particle in curved spaces and Weyl anomalies, Nucl. Phys. B 376 (1992) 113 [hep-th/9112035] [INSPIRE]. M.G. Schmidt and C. Schubert, Worldline Green functions for multiloop diagrams, Phys. Lett. B 331 (1994) 69 [hep-th/9403158] [INSPIRE]. N. Chair and M.M. Sheikh-Jabbari, Pair production by a constant external field in noncommutative QED, Phys. Lett. B 504 (2001) 141 [hep-th/0009037] [INSPIRE].